This pocket abdominal binder is a specially developed binder with a pocket to hold a cold/hot pack for additional pain relief and comfort for abdominal incisions during surgery recovery. The abdominal binder provides gentle compression to aid in abdominal surgery recovery while the pocket's cold pack provides additional pain relief for wound care. The pocket binder is available in 3 sizes and is 6" wide for optimum comfort. It is great for all types of hysterectomies (horizontal or vertical incision, laparoscopic or daVinci robotic). The pocket binder is a real help for side sleepers allowing you to recline in comfortable cooling support during surgery recovery. Comes with 2 cold/hot packs. Position the binder with the pocket next to and across your belly. Make sure that the pocket is on the inside of the binder when wearing it for optimum cooling affect on your incisions. Overlap the velcro ends to secure the ends. Not snug enough? Open the velcro and pull the binder snuggly across your belly. 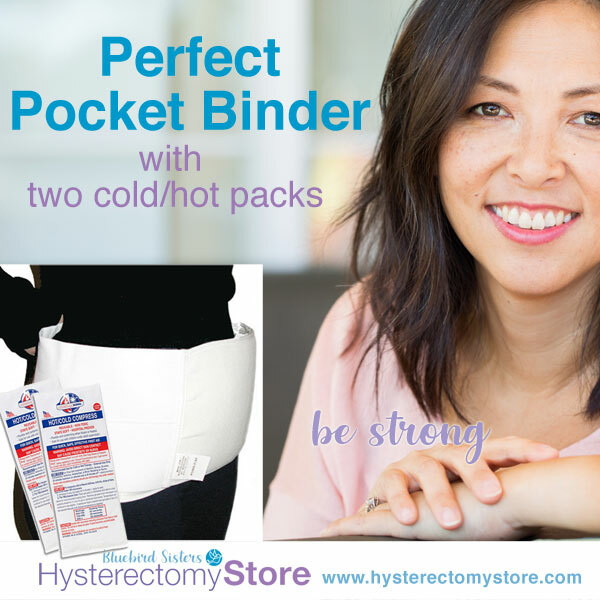 Once you have the binder in place, slide the frozen cold pack into the pocket. Remember to put the other cold pack into the freezer so you will have it ready when the first pack has lost its cooling ability. See Video Below with instructions on how to wear the pocket abdominal binder. The Perfect Pocket comes with 2 of Cold/Hot packs. These 4" X 9" reusable gel packs can be kept in the freezer, and are always soft and flexible, even straight out of your freezer! 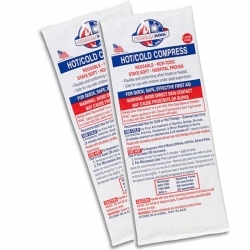 You have one Cool/Hot pack to put in your Perfect Pocket, and a second one to keep in the freezer, ready for as you need it. These same gel packs can be microwaved to provide you with comforting warmth, if recommended by your doctor. 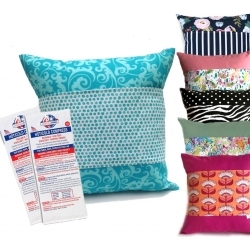 These Cold/Hot packs are also useful for a variety of family emergencies, after you no longer need them for your healing tummy. 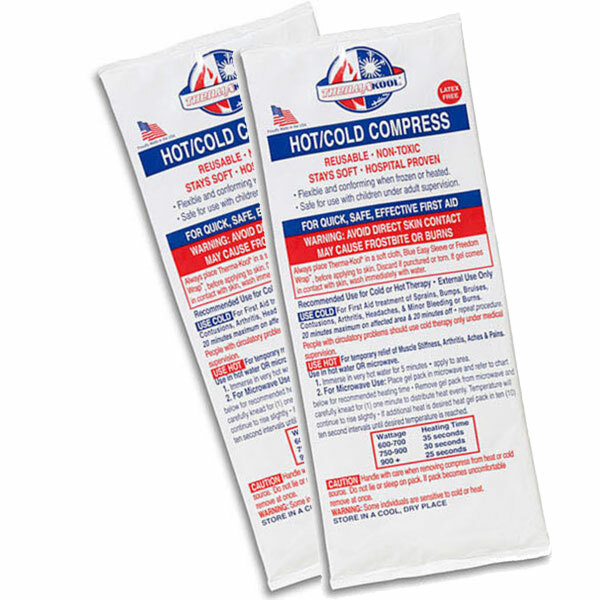 The Cold/Hot packs are also sold separately in packs of two. Compression after a laparoscopic hysterectomy or open abdominal hysterectomy, myomectomy, appendectomy, c-section, hernia surgery, or tummy tuck is helpful to your recovery. Machine washable cold/delicate, light dry. We suggest using a Silky Sac washing bag to keep the binder's velcro from snagging. HSPCS code: "L0625 - Multiple Use Elastic Abdominal Binder". Note: HS Store is not responsible for filing insurance claims for products. The customer is responsible for all insurance paperwork. 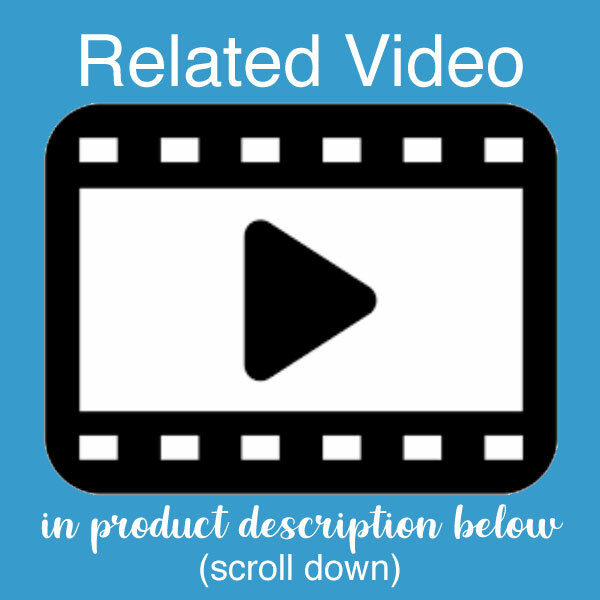 HCPCS Disclaimer: HCPCS codes and Home Health Consolidated Billing codes provided by HS Store are intended as general guidelines only. HS Store does not guarantee coverage or reimbursement of any products. You must address all coverage and reimbursement issues (including the correctness and accuracy of codes) with your insurance provider. It is your responsibility to ensure the accuracy and appropriateness of each claim you submit, in accordance with all applicable requirements. Why does this binder have a pocket? The binder's pocket is for adding a cold/hot pack against your tender belly. After major surgery, simple ice packs may help reduce pain. Ice packs can help minimize swelling around the incision, reduce bleeding into the tissues, and reduce pain. Can I order this binder elsewhere? Will my hospital have a pocket binder? You can get the Pocket Abdominal Binder only from the Hysterectomy Store. This question, also, gives us a chance to tell you the history behind this special binder. The Hysterectomy Store (previously named HysterSisters Store) has sold binders almost 20 years. Back in those days we found a product we called the Belly Band - that was a band with a gel inside that was activated with water. Although it was nicely cold for tender bellies, it was also wet! And so, we determined to find a way to give women the benefit of the binder while also adding a cold pack for the benefits of cold (or warm!) against incisions and overall tender, sore tummy without the wet factor. In developing a prototype, we actually took one of our specially designed binders - and added a pocket - sewing it on Kathy's (founder of HysterSisters) kitchen table. Wa-la! We ended up having to redesign the shape of the 6" binder slightly for the pocket binder - because of the added shape of the pocket with the ice pack - and it worked! Then we called the manufacturer and sent the prototype to them. "Yes," they said. They could produce them. A few trial and errors later, we had the pocket binder in stock - and we named it the Perfect Pocket Abdominal binder - because, well, we think its perfect! Can I use the Pocket Binder without the cold/hot pack? Absolutely! 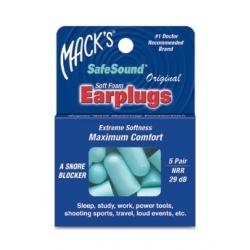 In fact, if you can only buy one product for your surgery, this is a good option. 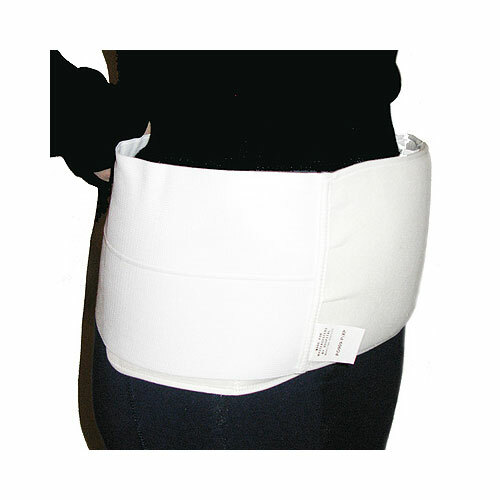 This binder can be used with the cold/hot pack and without it - both will provide gentle compression. Adding the cold/hot pack - frozen - helps with pain and tender swelling of your belly. So yes, your Pocket binder can definitely be used without the cold/hot pack. Can I wash this binder? Yes! Wash in cold water on delicate cycle and tumble dry. We always recommend buying a Silky Sac laundry bag simply because it helps keep the velcro of the binder away from other clothing you might wash at the same time. The Silky Sac is perfect for all your delicates and socks. Can I use this binder for c-section? Of course! 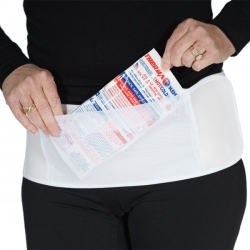 This binder provides gentle compression along with cold/hot pack for any abdominal surgery such as myomectomy, tummy tuck, c-section, and hernia repair. Can I use this binder for daVinci Robotic hysterectomy? Can I use this binder for my laparoscopic hysterectomy? Yes, although laparoscopic hysterectomies have smaller incisions, you will find that there is usually a central incision that is more tender than the other smaller incisions and your belly will be tender and swollen. This binder provides gentle compression with an ice pack! In fact, we send 2 cold/hot packs with the binder. Use one while the other is in the freezer. Will you help me file to get my binder reimbursed by my medical insurance? The Hysterectomy Store assumes no responsible for filing insurance claims for products. You can ask your medical insurance for the proper paperwork and use this code as the HSPCS code: "L0625 - Multiple Use Elastic Abdominal Binder" - but even this code does not work for all insurances. The customer is responsible for all insurance paperwork. 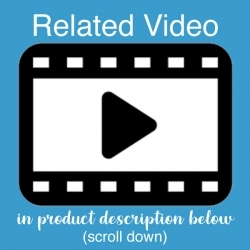 HCPCS Disclaimer: HCPCS codes and Home Health Consolidated Billing codes provided by HS Store are intended as general guidelines only. 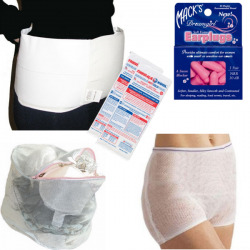 Hysterectomy Store does not guarantee coverage or reimbursement of any products. You must address all coverage and reimbursement issues (including the correctness and accuracy of codes) with your insurance provider. It is your responsibility to ensure the accuracy and appropriateness of each claim you submit, in accordance with all applicable requirements. Another question? Contact us and ask us! Bought mine with a set! Favorite product! I got this binder with the pocket in my set for Hysterectomy Prep and I loved having the frozen packs to put next to my sore tummy. Thank you for this product! I have had c-sections in the past and wish I had on of these binder bands back then. Two weeks ago I had a large upper abdomen hernia and gallbladder surgery. The band has been a lifesaver! With my hysterectomy now scheduled in a few weeks, I know this will really make a difference again. Thank you so much for a wonderful site and making available such wonderful products! This was a godsend and I would not have been without it for anything!! I'm 11 days pre-op, and I used the binder every day in the hospital, every time I was getting out of bed. I made sure I got it around my stomach before trying to sit up (nurses helped) Sometimes, I even slept with it to keep the stomach in place. It made everything so much easier! I have it in bed with me all the time. I often loosen it at night to give my stomach a rest, but I never remove it, to make it easy to put back on if I have to get up. Several nurses noticed and commented on the great effect it had on me and how much it helped me, so I hope they bring this more into the hospital here in Norway, for more patient groups. I'm so glad I ordered this. I received my package a few days before my laparoscopic abdominal hysterectomy with BSO, so it was all ready for me to use when I came home. The cool packs fit nicely into the pocket, and the band is very comfortable and easy to wear. I found the cool packs helped me a lot with pain and later, helped stop my skin from itching. This will come in handy for back pain in the future. This product is well-constructed and durable! The extra items in the package were also quite helpful, especially the Hystersisters book. Thanks! 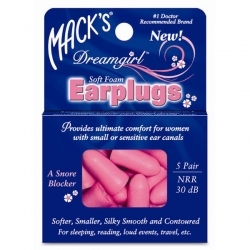 I ordered this for my hysterectomy but before my surgery, my DD was complaining of severe cramps. I tucked a hot pack in, wrapped it around her waist, and her cramps were conquered without having to resort to strong medications. Fast forward to my hospital stay; a TAH with a lot of internal stitching and pain not controlled by narcotics. The hospital wouldn't allow the hot packs (it's a military safety thing) but the nurses were able to provide warm packs, which provided some relief, especially with those awful gas bubbles! When it came time to walk the halls, having the abdominal support made all the difference. The binder brought me home in the car and has been a real help when the pain meds just don't seem to cut it. The slight pressure is perfect for controlling the swelling and it is adjustable to accommodate my abdominal ups and downs. I have the P/XP size which easily fits my size 16 hips. This is such an improvement on the standard abdominal binder given post C-section. It doesn't roll or curl up or shift like the wider one did, it's easy to adjust quickly and the cotton cover is very soft and comforting. It also fit beautifully under my tunic, no one realized I had it on. Definitely worth the investment. I did not think about needing a belt prior to my surgery. I felt I needed to hold my stomach when walking after the surgery, and decided to order this belt to help me feel supported. I received this belt on day 4 post-op. What a difference! It made me feel much better. I would recommend it to anyone having the surgery. I wish I had it from day one.